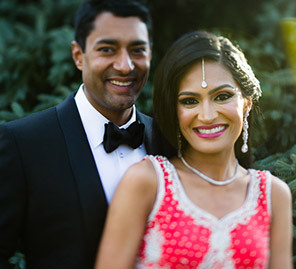 'Tweethearts' Sumita and Anuj first connected on Twitter, and over time they fell in love and tied the knot in a hip #TwitterThemedWedding in Atlanta, US. Sumita and Anuj are in love with Twitter, hashtags and each other. Their relationship started with tweets, so it was little wonder that their entire wedding was an ode or tribute to Twitter, the social media channel which brought them together. Here, bride Sumita shares details of their Twitter-themed wedding that also included Rajasthani and Gujarati rituals. "My friends know I am obsessed with Twitter and use it to connect with people with similar professional interests. I also have a knack of finding social media contests on Twitter and have won tickets to almost every local concert and sporting event I can think of. Therefore, it was no surprise to anyone that I met my fiance on Twitter! In September 2013, I was searching for tickets on Twitter for Jazzoo, an annual event held at Zoo Atlanta. I searched "Jazzoo Tickets" and Anuj's tweet popped up. He had tweeted if anyone wanted to join him because he had an extra ticket. I asked him if he still had it. He had already given up his ticket but his biography caught my attention. We started chatting and our tweeting turned into Direct Messaging, emailing, texting and phone calls - and then we met in person. The rest is history I guess!" "Anuj's proposal was "Twitter" themed. The day started with my sister taking me to Drybar to have my hair done. As soon as we left the salon, a few friends were waiting outside with cameras. They had the first clue for me along with instructions for the scavenger hunt. Anuj had created his own "tweet" clues which were time stamped with the exact time I was to receive each clue through the day. The tweet clues always led me to a meaningful location in our relationship. At each new location, there was a friend waiting for me with a rose and the next clue. Anuj was also tweeting as soon as I received a clue with the unique hashtag "#SumitaFindAnuj". One of the last clues included a horse carriage ride around downtown Atlanta which ended at the W Hotel where he had booked a room. When I went in, my dress and my shoes were already laid out, along with the last clue, which asked me to take the elevator up to the helipad where he was standing, holding a tweet sign that said, "Will you marry me?". After saying yes, we headed down to the hotel where my friends surprised us with a dance performance. After the dance, we headed to Tin Lizzy's restaurant, where our families were waiting for a celebratory dinner. It was truly a magical day." "We got married at the Atlanta Evergreen Marriott Conference Resort in Georgia. When we were looking at venues, we wanted a place where our guests could enjoy a mini vacation experience. This venue enabled that as it was a resort. It had comfortable and spacious guest rooms, large banquet halls, multiple restaurants, and many activities for children such as a game room, movie theater, and swimming pools." 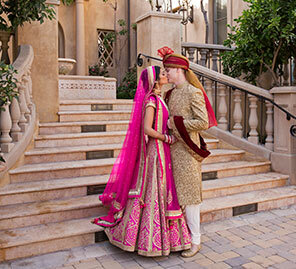 "Our wedding was a mixture of our Indian and American heritage. My parents are originally from Rajasthan but grew up in Hyderabad, and Anuj's parents are from Gujarat. We wanted to capture the cultures of both sides but also give a nod to our American upbringing. We both started with separate Ganeshji Poojas at home and then had a mehndi, haldi, sangeet, wedding ceremony and reception at the Marriott." The mehndi and sangeet functions were extremely colorful and vibrant. The mehndi decor included some lovely Rajasthani touches. Sumita wore a pink and green lehenga with big golden thread motifs by Sabyasachi Mukherjee, while Anuj wore a kurta with dull gold embellishments and pyjamas. "The wedding ceremony was held outdoors, under a pavilion next to the brilliant blue waters. We opted for fresh flowers all around our mandap to bring out the beauty of our surroundings." The mandap was festooned with champagne colored drapes around the four pillars and the canopy was surrounded by beautiful floral arrangements in pink, peaches and warm yellows. Sumita looked beautiful in a pink and gold lehenga from Radhika Boutique in Hyderabad with all over gold thread embroidery, while Anuj wore a traditional light cream sherwani with beige pajamas, and a pink and beige 'safa' (turban). "The reception was a little more American in essence - we wanted an elegant yet exciting atmosphere, and our decorator did a great job in making that happen with lavender drapes in the background of the stage that was festooned with classy floral arrangements. My reception dress was a white, full-sleeved gown that was made from hand-picked material and was stitched by a local tailor in Hyderabad. Anuj’s tuxedo for the reception was from Polo Ralph Lauren." 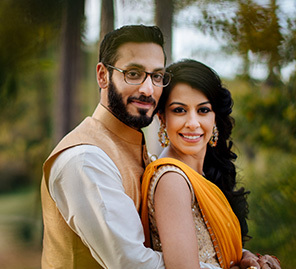 "We both did a majority of our wedding shopping in Hyderabad and Gujarat. I wore a total of seven outfits and Anuj wore five. He opted for hand-stitched outfits from India and a Polo Ralph Lauren tuxedo for the reception. I shopped with Sabyasachi and Radhika Boutique in Hyderabad, and my aunt had my reception outfit hand stitched with the material she found in Hyderabad." "To be honest, when I first embarked on planning this wedding, I was afraid that I wouldn't be able to find what I wanted in Atlanta. However, I was pleasantly surprised that the wedding market in the US has changed so dramatically over the last decade, so one can find almost anything if one looks hard enough. However, we opted to go to India for shopping simply because there is a lot more variety there and the prices are much more competitive. 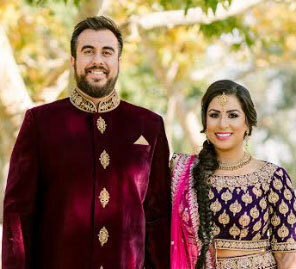 I really wanted uniqueness to be a key factor in our wedding and by going to India, I was able to choose jewellery, outfits, gifts, and other items for our guests that I know they wouldn't be able to find locally in the US."